The 2014 World Series of Poker Main Event offered a brand new payout structure that included something never before heard of in WSOP history. A guaranteed prize amount was announced for the 1st place winner, set at $10,000,000 (to commemorate 10th anniversary of hosting by The Rio, and eventually won by Martin Jacobson). After receiving a lot of negative feedback from the poker community, however, officials have decided to restructure the Main Event’s payouts once more. The 2015 World Series of Poker Main Event will guarantee the top 1,000 finishers receive a prize, and that every single prize will result in a profit to the player. The minimum payout anyone who finishes within the top 1,000 places will receive has been set at $15,000; 50% higher than the event’s substantial buy-in of $10k. While no other prizes are guaranteed at a particular amount, the WSOP’s announcement did offer a comparison based on the 2014 WSOP Main Event, in which 6,683 entries created a $62,820,200 prize pool. If the 2015 WSOP Main Event were to draw the same field, or higher, all members of the November Nine would be guaranteed to win at least $1,000,000 for their efforts, with $8,000,000 reserved for the champion. Last year, as has been the norm in most WSOP Main Events throughout history, about 10% of the field received a slice of the pie, but because $10mm was skimmed off the top for the 1st place winner, the winnings for lesser paid positions were reduced. Mark Newhouse, who finished 9th in the WSOP Main Event for the second year in a row, received $730,725. 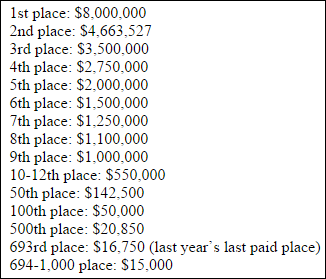 That’s actually $2,499 less than he received in 2013 ($733,224) when the overall prize pool was $3mm lower ($59,708,800). WSOP officials were met with strong criticism over last year’s restructuring, saying the payouts were too low – and too few – for players who didn’t make it into, or close to, the final table. With that in mind, WSOP Executive Director Ty Stewart decided to try another conceptual structuring. But this time, it’s likely to appeal to a lot more players. Going back to the previous example, if the 2015 World Series of Poker Main Event were to draw the same number of entries as last year (6,683), WSOP.com said the payout structure would range from $8,000,000 for 1st place, to $15,000 for places 694th-1,000th (see image right for sample payout structure from WSOP.com). ‹ Will Yahoo! be the next big name in real money online poker in the US?